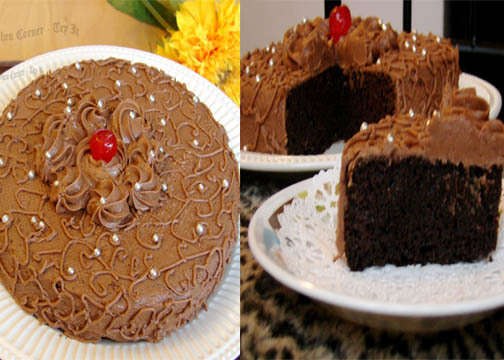 Mocha cake as the name suggests is a dense moist coffee flavored chocolate cake. I adore coffee flavor and the combined flavor will not disappoint you. The frosting is butter cream flavored with cocoa and coffee.This is a delicious cake. I made it a one layer cake,but you can make into a two layer cake as well. Try this,you will surely love it. Preheat oven to 350 degree F and grease and prepare cake tin. Mix espresso in 5 Tbs of hot water and keep aside. Melt butter and allow to slightly cool. Beat egg and sugar till the egg become double in volume. Mix in butter, low fat yogurt,3 tbs of espresso diluted and vanilla essence. Mix together and fold in the dry ingredients using gentle strokes with a spatula. Pour into greased baking pan and bake for 20 - 25 minutes or till the tooth pick stuck to the center comes out clean. Remove from the pan and allow to cool for 10 minutes. Run knife around the edges and invert cake to a cooling rack. Allow to cool down completely before frosting. To make the frosting, beat butter for a few minutes with a mixer on medium speed. Add 1/2 of the powdered sugar and turn your mixer on the lowest speed until the sugar has been incorporated with the butter. Add the next half and again gently mix.Increase mixer speed to medium and add vanilla extract, espresso and melted chocolate. Beat for 3 minutes. If your frosting needs to be thinned out, add 1 tsp of milk. Spread evenly on the cake. Refrigerate the cake for about an hour before serving. U r killing me with the beautiful cake.Love the pictures. Classy cake !! Love mocha cakes !! drooling all over the lovely cake and beautiful frosting! Classic cake dear,the frosting looks elegant & yummy chocolaty bite!!! Pure temptation in front of me....beautiful cake. Love the ingredients too. Yummy! A killer cake! Love the thick creamy frosting. Oh! what a fantastic cake...It's awesome...so beautiful frosting...absolutely soft and yummy...love this mocha cake. wooow..Looks great n yummy yummmy..Lovely presentation!! Omgggg, i want that huge slice rite now..Wat a gorgeous cake Suja, cant take my eyes from ur clicks. So delicious and chocolaty! Yum!! very beautiful cake.. like it..
You have made this choco mocha cake a hit by your perfect click, it has enhanced the richness of the cake, just awesome. Yum, yum!! Oh my favourite flavour in a cake!! Beautiful cake, you made it very well Suja. Love to have a slice. Even I love coffee flavor dear..I think this was one of the beat cakes you made..Nice combo of flavors here Suja. wow perfectly decorated cake. really appreciate if u visit me too. I just love coffee flavored cakes. This cake looks too good! Perfection !I wish to grab a bite! like the cake but double like the cake design, and the pearl added on top of it..Suja, is it edible? Perfect and nicely decorated cake. 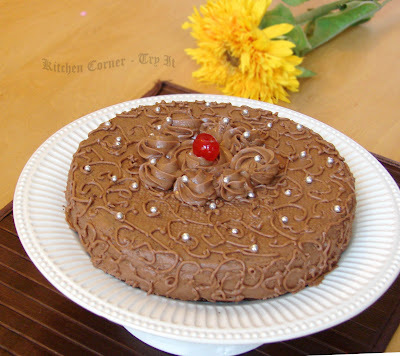 Beautiful cake,lov mocha flavor in desserts.. I am in love with ur mocha cake.I always like coffee flavoured cakes. WOW...I'm sad I don't have a piece of that!